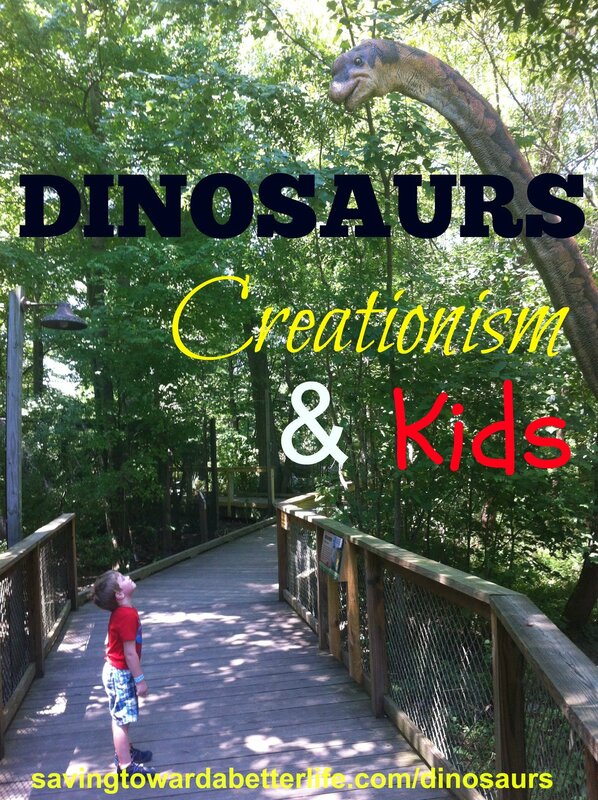 Dinosaurs, Creationism and Kids | How do we teach them the truth? Dinosaurs, Creationism and Kids | How do we teach them the truth when no one else will? This is going to be controversial. But it’s something I’ve become passionate about. We are homeschooling for a number of reasons. Lots and lots of reasons. One of them is to be able to teach Bug what we believe and why we believe and why we don’t believe the other theories out there. Creationism is the belief that the Universe and living organisms originate “from specific acts of divine creation.” For young Earth creationists, this includes a literalistic reading of the Book of Genesis and the rejection of evolution. Plain and simple, that’s what we believe. And that doesn’t fit with anything that is taught about dinosaurs anywhere. If you think your preschooler is safe from Satan trying to make a foothold in his life for later doubt and skepticism, you are wrong. All you have to do is open up 99.9% of books about dinosaurs or turn on Dinosaur Train and let them start telling your child that dinosaurs lived millions of years ago. It’s the first lie the world will try to feed your child. And if they have any interest in dinosaurs, you have to be proactive about heading this lie off. We’ve barely even scratched the surface of Kindergarten and we’re already tackling this head on. Bug has taken a huge interest in dinosaurs. And when he takes an interest he doesn’t just play with dinosaur toys and stomp around the house pretending to be a dinosaur. He wants to know everything about them. So here we were at a precipice. He already loved Dinosaur Train and could tell you a lot about dinosaurs from it. So we had a frank discussion about how sometimes people just said things that were wrong. As best as I could, I explained that there are people out there that don’t believe in God, so they don’t believe He created everything and they make up “facts” to try to prove that God didn’t create the world. And that a lot of those facts have to do with dinosaurs. It boils down to this, you cannot believe dinosaurs lived millions of years ago before man AND believe in Biblical creation. Biblical creation points to a young Earth. I’m not going to squabble about particulars, estimates vary between 6000 and 7000 years. I can’t be sure, but it is safe to say that the Earth is less than 10,000 years old. But it DOES matter and there ARE answers. And you need to have the answers to those questions before your kids even ask them. But I’m not a scientist. How can I explain this too them? You don’t need to be a scientist. In fact, scientists have come up with a lot of complicated, full-of-holes theories to a very simple question. If you believe in God and His omniscience, omnipotence, and omnipresence then this is not a complicated issue. That is what you need to teach your first science lesson. In the beginning, GOD…. Truth #1: Based on the Bible the Earth is estimated to be around 6000 years old. You know all those books of the Bible that tell how old people lieved to be. Those accounts have been used to trace back how many years between Genesis 1 and the birth of Christ. Truth #2: God created the world literally in 6 days. Land animals (including dinosaurs) and man were created on Day 6. Now, if we take the Bible at what it says, then these facts are easy to put our faith in. But there IS scientific fact to back this up and we will get to that in a minute. I’m not going to try to tell you, but I’m going to share the resources I have used. But first, Christians need to stop making excuses for the world view of Dinosaurs and how they relate to creation. I have heard Bible-believing people just pass the two lies above to their kids without batting an eye. I have heard Christians try to align Genesis 1 to the worldview of creation by saying there were “thousands of years” between what is called “day 1”, “day 2”, etc in the Creation story. We do not have to align the Bible with what agnostic/atheist/unbelieving scientists are passing off as fact. We do NOT. For one, it won’t work. And secondly, evolutionary science is a lie and the Bible is the truth. Lie and truth don’t mix. With all that said, I’m going to share with you the books I’ve turned to for answers. The first is Unlocking the Mysteries of Creation, The Explorer’s Guide to the Awesome Works of God, Second Edition . I have the first edition of this book. I’ve had it for 10 years at least. It wasn’t until I got this book – and I was an adult when I got it – that I finally got the answers that had been swirling around in my brain for years. It is a wonderful book. Lots of brightly colored illustrations. It covers everything from creation, to dinosaurs, to the Flood, to evolution and more. It’s very comprehensive. I think everyone should own this book! Bug enjoys looking at it and if he asks a question about any particular illustration I can explain it on his level but this is more a resource for you as a parent or for your older (high school aged) children who are already familiar with some of the scientific concepts discussed. We found Dinosaurs Unleashed: The True Story About Dinosaurs and Humans at our local library. I was thrilled. Bug LOVES this one. We’ve checked it out multiple times. This one is great for all ages. It has cool dinosaur pictures and facts about dinosaurs minus all the “millions of years ago” and “Cretaceous time period” and “Mesozoic Era” information that clutters other dinosaur “fact” books. It also points to proof that dinosaurs and humans were alive at the same time and provides answers to what happened to dinosaurs during the flood, how they became extinct and more. There is another book I found at our local library, Truth Be Told , that is written by the same author as Dinosaurs Unleashed. It had some of the same topics with a lot more indepth stuff. It’s written kind of like a text book complete with chapter review questions at the end. This might be a good resource in your homeschool science classes. Answers in Genesis is a great site to check out too. And I want to take Bug to The Creation Museum very soon! I hope this has helped open your eyes to something I feel is often overlooked even by well-meaning Christians. We think if we teach them about Jesus, salvation, repentance we’ve done our job. But if we can’t solidify all areas of the Bible in their minds and our own minds too, then we’ve left holes for others to fill. For some people, “just because” is not an answer. That doesn’t mean that those people (I’m one of them) don’t have enough faith. And it’s perfectly acceptable to back up our faith with facts. We have the Bible, we have to information to answer the questions we have. Sometimes we have to put aside what we’re programmed to think, clear our minds of what we’ve been misinformed about, and look at things with new eyes. So if you made it this far through the post, I would love to hear your thoughts! I homeschool too and one of the many reasons I do so is to counteract the media and textbooks that are being pushed on our children that do not line up with God’s Word. Thanks for being open and honest about where you and your family stand on this topic. Thanks! I hope you’ll share the post! I did read through this and look at your resources. I grew up Catholic. That in and of itself says things. I am going to ask some questions and I hope you don’t take them personally. How do you feel about fossils and carbon dating? What about using What about using radiation to tell how far something has decomposed? They use the chemicals on the periodic table of elements. Some elements existed millions of years ago that no longer exist because they died out from living too long. How is that explained? I literally watched a wooly mammoth being excavated from under a pond that has existed for a very very long time. I saw the bones with my own eyes. Yet there are no human fossils dating to the time period of dinosaurs. We have mummies and such but nothing as old as the dinosaur fossils. The bible is just an interpretation of the word of God. God himself did not literally write it with margins saying how long it took back in that time when time was kept differently. Also, if the bible is the word of God why do so many religions rewrite it to their satisfaction? If it was truth then it shouldn’t be changed or altered in any way. However, science has proven with hard evidence the existence of dinosaurs in multiple time periods and how they have changed. Literally things that you can see and touch. Things that have been dated millions or billions of years ago. Does that mean that fossils are a lie? I would greatly like to hear your thoughts on this topic. I am very curious and nobody can ever seem to answer my questions. Thank you for taking the time to read my comments and hopefully respond. I don’t have all the answers but I do appreciate your questions. As far as religions rewriting the Bible – I would steer clear of those! I’m a big believer of reading the Bible for yourself to know what’s in it. And I go to a church that sticks to the Bible for teaching and instruction. My Christian denomination hasn’t changed the Bible, or written extra books or had “prophets” come along and claim to have new messages from God. The Bible in it’s true form is the “inspired word of God”. Now, if you can’t find it within you to believe the Bible is infallible – that God inspired men to write down these words – then I can see where it would be difficult to reconcile what the Bible says with what “science” says. But my faith is rooted in the fact that the Word of God is just that…the Word of God. Lee Strobel is an author who has written many books. One I read was “The Case for Creation”. I think it might be a good resource for you. Lee Strobel was an atheist investigative journalist who set out to write a book to prove God wasn’t real. But while researching his book, he discovered that God is real. Now he is a Christian and has written many books on his research on Creation, Christ, Christianity and more. But even if you go beyond the Bible, two well known ancient historians Herodotus (450BC) and Josephus (AD50) wrote of similar animals. Thanks for your questions! I would love to hear more from you! I, too , questioned this extensively. The one thing God keeps bringing me back too, is that we should start with inherent, God breathed Word for answers. If you start with Genesis, you’ll notice the 7 literal days are in a very logical order. God had an amazing plan from the beginning. I’m starting to look at it in a different way. I no longer start with what Science says; I start with what God’s word says. God is faithful, and if you look around, you can see how Science (if used correctly) confirms God’s creation. We have been lied to since we were very young about the age of the Earth and it’s so difficult to rebuttal this in your mind. Pray to God for guidance in the issue. Let Him take you on a journey to find the truth. He is faithful. Thank you for this. I’m not sure where you live, but there is a creation museum in Glenrose, Texas. It is small and not overly dance, but well organized. The museum shows how dinosaurs and man lived at the same time. We took our daughters to this before we went down the road to the Dinosaur State Park; which preaches millions of years. It was very helpful. (Ok, WARNING–passionate, joyful, just-discovered-the-truth post ahead!) ;D First off, I 100% agree with your sentiment about the importance of this subject! I actually just did an amazing dinosaur unit study with my kids (K & Preschool 3) that was NOTHING like the ones I had in school growing up! ;) We covered it all–the Flood, rock layers, fossils, the origins of the name “dinosaur” & what ppl called them beforehand (including in the Bible), recent discoveries like dinosaur soft tissue, blood, parts of DNA, etc. It was the FIRST TIME I’d heard ANY of that stuff w/o the neo-evolutionary spin! Creation makes SUCH perfect sense on a grand scale, when you hammer out all of the scientific details, & meticulously go over the overwhelming amount of physical evidence for it! That’s what my mind was craving all these years! Why don’t more Christians educate themselves about this?!? Why are we as a church so careless with our kids’ education?? The question of origins is so completely essential to true faith…plus, it’s absolutely amazing & awe-inspiring (especially when you get into cosmology)! It’s such a crime that our education system (& museums, libraries, etc) are so stubbornly censored! :o I got angry thinking of all the years my head was so filled with the junk they teach in public schools! The truth really does set us free & I’m thanking God that I finally discovered it! Thanks for your fabulous addition to the conversation! I will have to check out those YouTube videos. I’m teaching a Dinosaurs & Creation class for our homeschool co-op in the fall so those will come in handy! Great stuff!!!! Doing a 1st grease Research Report on Dinosaurs!! Love this! Excellent information here! I think I will read the books and possibly use them in our homeschool co-op. Thanks! Great article you should look at the app splat it teaches about creation in a phone way. Is a Christian app for kids. You can get the creation case series for free. If you pay the app then you get more kids Christian programs.